Below zero temperatures greet Paula Todd King and I as we venture into Cloud’s rugged wilderness home on the Wyoming-Montana border in mid-November. Meteorologists predicted that the frigid conditions would gradually give way to warmer temperatures during our four-day visit. They lied! Every morning begins with temperatures below zero, so we spend the first few hours driving the heated SUV (emphasis on the heated!) and towing the UTV into the low country of the Pryor Wild Horse Range. These cryptic and often elusive animals are in plain sight near the road. We watch as multiple rams vie for ewes. The yearlings and fluffy, big-eyed lambs follow along with their mothers. Day One. By the time we start up Tillett Ridge in the UTV, temperatures climb from 9 below to a few degrees above zero. We have high hopes of finding Cloud’s family and Encore with her bachelor stallion entourage. Also on our high hopes list are sightings of the new foals, particularly Ketchikan’s colt in Gringo’s Band, born just a few weeks ago. We’re barely underway when it starts to snow, limiting visibility to a few hundred yards. “Cloud will have to be standing in the road for us to see him,” I joke to Paula. We spot Casper’s band on a hill to our right. One of the duns is missing; the two year-old stallion, McKeahnie. McKeahnie has been testing the water for months, spending time away from his family, then returning. It can be hard to break strong family ties, particularly if the band stallion is as permissive as Casper. When we climb onto the open ridges of Tillett, we see trotting horses in the distance. I lift my binoculars as one of them turns its head. “Mato Ska!” I see the bold blaze of Cloud’s blue roan son. He’s trotting behing his older, half- brother Jasper, Flint's son. “Where’s Demure?” We look around for the grulla mare Jasper won this spring. Instead, we see a big band coming. It’s Doc with the family he won from Jackson in May, after abandoning or losing his mares, Broken Bow and Demure. Bear with me here. Doc’s demolition derby is complicated. It began in May when he either abandoned or lost his band. Then he seriously injured Cloud, kicked Mato Ska out, claimed Feldspar, Innocentes, and Encore, who had just turned one year-old. Shockingly, Doc lost Encore to the bachelor stallions, then lost Cloud’s mares or Cloud won them back. Next Doc set his sights on the biggest band in the Pryors. He defeated Jackson, claiming his mares and offspring. However, Doc kicked out two year-old, Maelstrom, and his yearling sister, Niobrara, the offspring of Jackson and Cloud’s daughter, Firestorm. These two youngsters were adopted by Hernando who had defeated Diamond to claim Phoenix and War Bonnet last winter. I told you it was complicated! As the snow continues to fall we notice a dark horse emerging from the dense forest. “Jackson!” Paula whispers. Doc notices him too, and pushes the band into a brisk trot away from the coyote dun stallion. Then Doc curls back and charges at Jackson, easily driving him away. Doc’s rise to dominance comes as a complete surprise to me. This once-mellow son of Winnemucca and Mateo is a late bloomer, bullying stallions he once avoided. As Doc's band disappears over the hill, Paula, Quinn, and I head uphill on the road. Seeing only the fresh tracks of Doc’s band heading down, we turn around. Again we spot Jasper and Mato Ska. . . and another horse. It’s McKeahnie. During our four day journey on the mountain, we see the young dun first with Mato Ska and Jasper, then with Jackson down at the mines, and, on our last day, back with his family. But today, we’re entertained by the gentle play of the two year-olds. There is no spinning and rearing, squealing and kicking. There is simply nibbling. Even five year-old Jasper seems to pull his punches when he plays with both McKeahnie and Mato Ska. 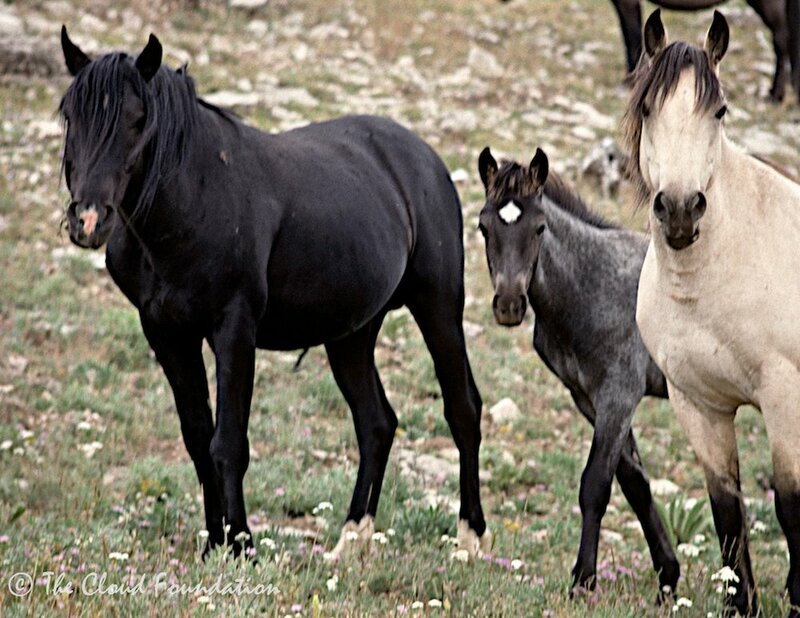 On our drive back down the mountain, we spot Cloud’s mother, Phoenix with War Bonnet, and their young stallion, the kind and gentle Hernando with Firestorm and Jackson’s son and daughter. Snow blankets their coats as they stoically forage. I feel a little guilty complaining of cold feet and hands when watching them. 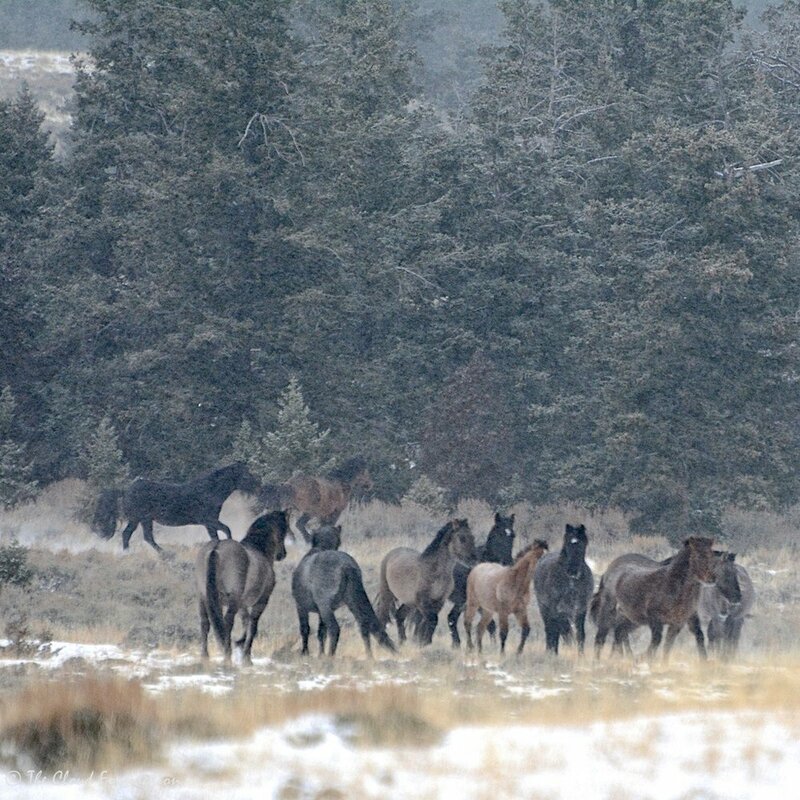 All the non-migratory wild animals are amazingly resilient, but none are as amazing as the wild horses to me. They are fenced in and truly prisoners of the polar vortex. Day Two. The weather clears but the temperatures are even colder. Like yesterday, we have toe warmers and foot warmers and I’ve added another layer of clothing. Reminiscent of Ralphie’s little brother in “A Christmas Story,” I struggle to bend my knees, slogging through the frozen landscape like a zombie. Even Quinn, our snow-loving canine companion, appreciates the protection of the UTV. 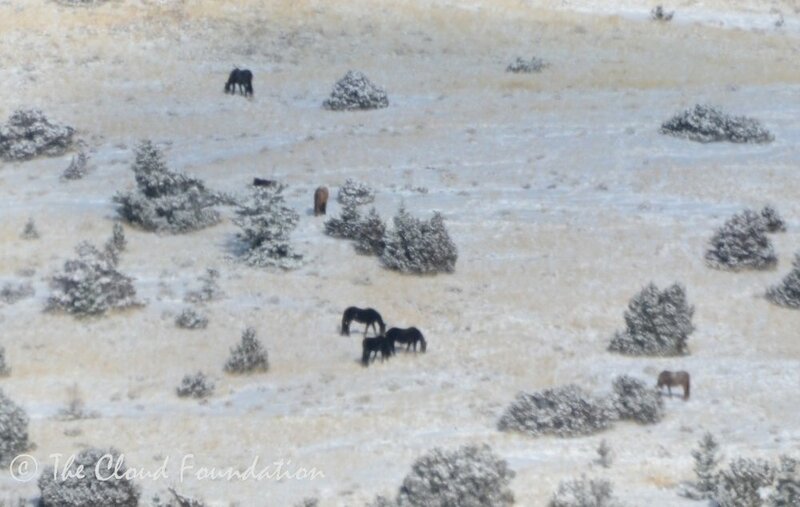 Glassing produces a sighting of a distant He Who (Horizon) with Jewel, Tonopah (the oldest horse in the Pryor herd), Lariat, and her foal, Oklahoma along with Cloud’s brother, the lieutenant stallion, Fiddle (Fiesta). On the hills below the mines we see Phoenix’s band again and other horses that we never could identify. Near the first water catchment on Tillett, we spot horses and, on closer inspection, identify Mescalero and his family. I've spoken of signature animals in the past, horses like Phoenix, Electra, and Cloud who are distinctive and allow us to identify what band we're seeing. In Mescalero’s band that animal is Missoula with his flaxen mane and tail. So pretty, I think. 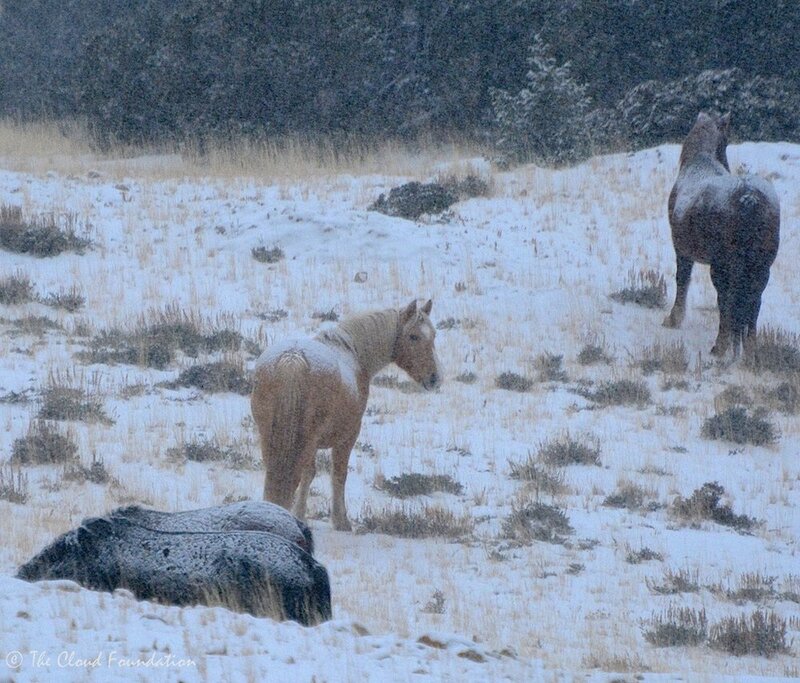 Missoula’s father is Diamond, the first wild horse foal I had ever seen. That was 20 years ago. I catch myself tearing up a bit. This will be my first fall in the Pryor Mountains without Diamond, Cloud’s older brother. Diamond failed to appear this spring after the takeover of his band by Hernando. In my experience, it is not unusual for a deposed stallion to simply disappear. They seem to lose the will to live. Where are you Cloud? From the ridges of Tillett we glass over toward Sykes and spot horses on an island in Big Coulee that I call Mateo’s Island. We see Electra and know that we’ve discovered Galaxy’s Band. This is alien territory for young Galaxy, but not for his lead mare, Electra. I’ve blown up the picture so you can see each member of the band, including Orolitto, laying in the snow to the left of his dun mother, Maia. After we took the picture, the colt bounced up, raced around, then nursed. We drive down Tillett without a sighting of a horse. They have to be somewhere. But where? Day Three. The only horses we spot are distant dots in the mouth of Big Coulee at the bottom of the range. “There have to be over 20,” I say to Paula. We can make out both Bolder and Flint’s bands. Then we try Tillett again. . . hoping. It is miserably cold and we find no horses, which makes it seem doubly cold. Discouraged, we drive down. At the gate of the horse range, we cross the cattle guard and notice tracks on the other side—lots of horse tracks. How strange, I think as I turn around to walk back to the UTV. Not 200 feet away are horses. It is Gringo’s band with Ketchikan and her new foal inside the fence line. Outside the range, on our side, is Galadriel and Oceana! Both foals look great, but are so small. It will take a miracle for the colt to survive the winter and probably for the filly as well. The colt’s name is Okiotak, an Alaskan name which means “one who stays all winter.” A fitting name for this tiny son of Ketchikan and I am sure Chance. Like Oceana he is a bright sorrel. He dances along with his mother, oblivious to the cold. I can see that Oceana looks like she will shed out to be a rich chestnut. Can you see the chestnut color on her face where she is shedding her foal coat? Good luck little ones. You will need it! We drive along the county road at the base of the range at sunset, stopping again to glass into the mouth of Big Coulee. I take pictures of an unidentified band on a side slope above the coulee. None are light colored. None are Cloud or Encore. Flint and Bolder are nowhere to be seen either. Day Four. Last chance day. We drive along the paved road in the early morning and spot a Bighorn Ram, two ewes and a lamb on a high hill near the Overlook. So lovely I think to myself. A mile away I see a familiar face that pops up over the hill near the highway. It’s Blizzard, the dashing, apricot dun stallion who has been responsible for more than one family breakup in the low country—what Lauryn Wachs calls “Drama in the Dryhead." He saunters over a saddle between two snowy hills and we follow on foot. Just beyond Blizzard are his “mares de jour”—Bakken, Strawberry, and Cascade along with the very pretty Blizzard and Bakken yearling, La Nina. They move cautiously away from us and we oblige by returning to our wonderful, heated SUV. The new additions are the yearling filly, Nova, who is the only true red dun in the Pryors and her grulla mother, Kitalpha, arguably the bravest mare on the range. I was present on the day Kitalpha was born into Durango’s band. I saw her overcome an early issue with lameness. Then her mother died when the filly was less than 6 months old and I believed that Kitalpha too had perished. Not so! The following spring she was photographed near a water catchment. Kitalpha is stunted as a result of losing her mother at such an early age, but she still had a healthy filly as a three year-old. Her story is truly a remarkable one. I will always wonder if her father, Durango, played a role in buoying the little filly’s spirits. On our way to Tillett, we identify the first bald eagle of the trip in a leafless cottonwood. 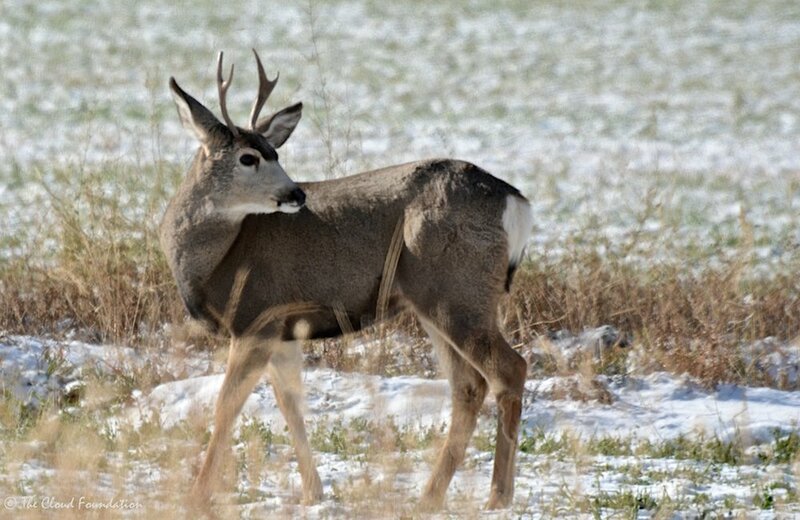 A young mule deer buck at the edge of the cottonwoods parallels the SUV, and a coyote races across a field, disappearing into dense willows along Crooked Creek. Up on Tillett again we stop when we see Casper’s band on the hillside near the red road. McKeahnie is still off on his own. The wind has blown 4 inches of snow into deep, slabby drifts. They prevent us from safely getting around the mines hill, so we stop to glass at a spot where we can still survey the Hell ‘n Gone. Far away, high on the mountain and to the west I find dots that look like horses. Through the scope we identify Duke’s big band plus an extra grulla horse. Is it Demure? I feel like this is only one of many questions for which we have no answers. But, the biggest unanswered question is yet to come. Late in the day, we glass over to a tiny sliver of distant Sykes Ridge that is visible between two hills in front of us. A black horse! We set up the spotting scope, but heat waves make the dark horse image shimmer, its shape distorted in the lens. As the sun dips low over the Beartooth Mountains, the heat waves disperse. I can see the short tail of a foal. Corona and Waif’s foal, Orion, has white on the legs, but I see no white on this foal's legs. Turn around, I whisper. If I could just see its face. An hour passes. The foal disappears into the trees, then returns to graze, and turns into the lens of the scope. The broad blaze of Ohanzee appears! We wait, hoping that the rest of the band will come into view. But they never do. Is Ohanzee all alone? Is his sister Orielle alive? Is Cloud just out of sight in the trees? With unanswered questions and lingering concerns, we drive down the mountain in the near dark. We can make out Casper's band again just above the road. McKeahnie is back once again. A lanky jackrabbit catches Quinn’s attention as it darts through the headlights of the UTV and drops over the edge of the road. Cottontails hop away and hide in the bushes. These are all temporary distractions. Paula is home now in New Mexico. 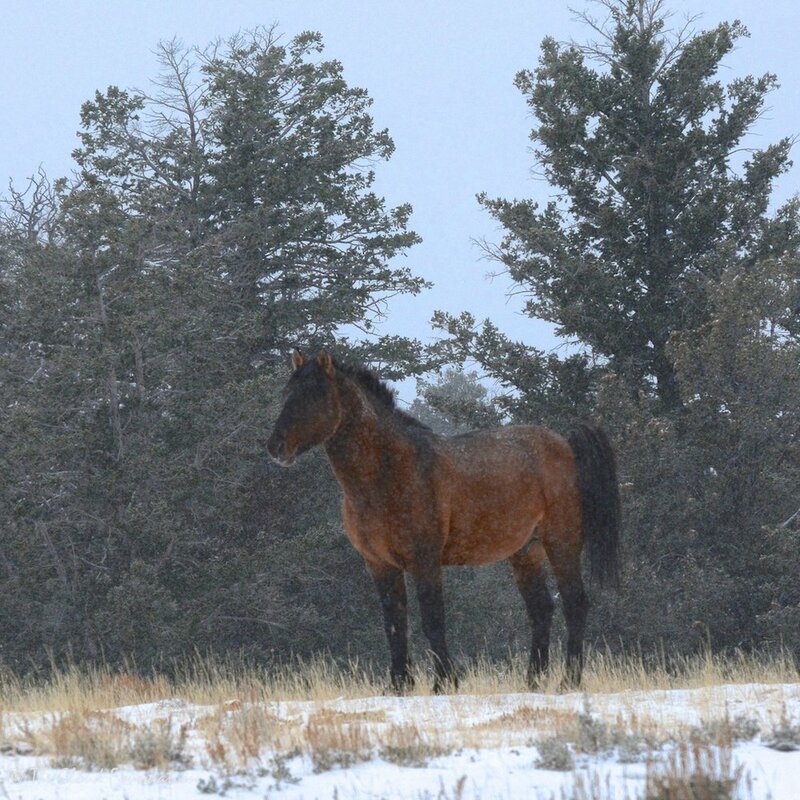 And I am home in Colorado, longing to be in the Pryors, looking for the colt I have worried about for nearly 20 years, and his spirited daughter, Encore, who captured my heart. PS. From all of us at the Cloud Foundation, Happy Thanksgiving! 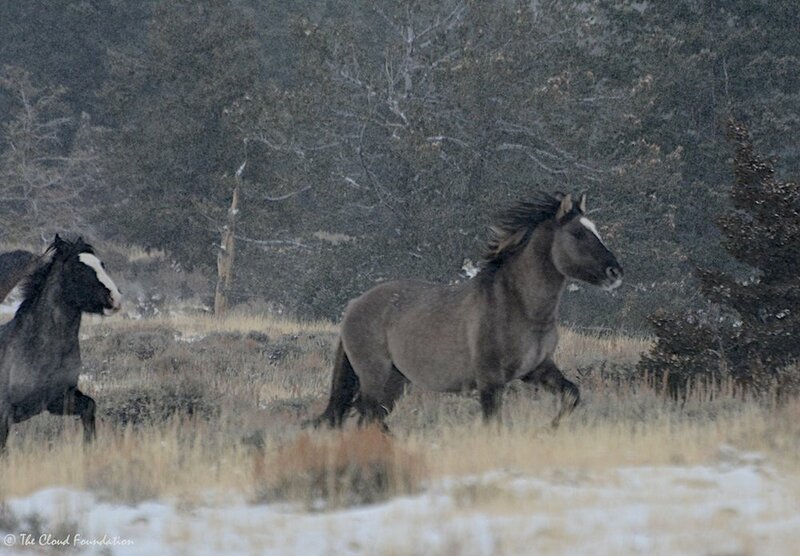 We hope you will keep our wild horses in your thoughts when you give thanks. We appreciate your kind support of our efforts to fight for their right to live in freedom with their families.